What in heaven’s name was this young woman thinking? Seriously, I also would like to know who sold her this dress. 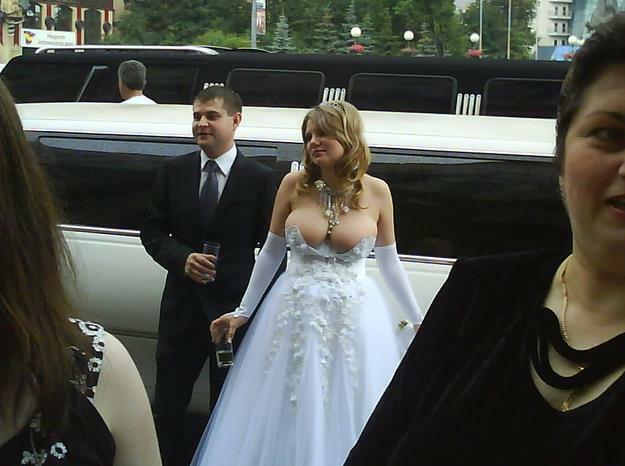 If I owned a business selling wedding dresses, I would let the small amount of profit go by the wayside, would you ever shop at the store that sold this? I wanna know what the heck kind of friends or family would fail to discourage her from wearing that? Surely SOMEBODY saw what it looked like when she tried the thing on, right? WTH? I know, don’t most brides go shopping with their mom? Hmmmm, maybe she wanted to convey to all she wasn’t a complete fake! It sure does leave little for the imagination, tho! We used to call that “no visible means of support”! She wanted to make sure that everybody knew it was all about her.